IS PERFECT IN FORM AND FEATURE! TOM THUMB IS A GIANT! curiosity. The plain truth makes it strange enough. You must see, hear and feel, and even then you will leave wondering. 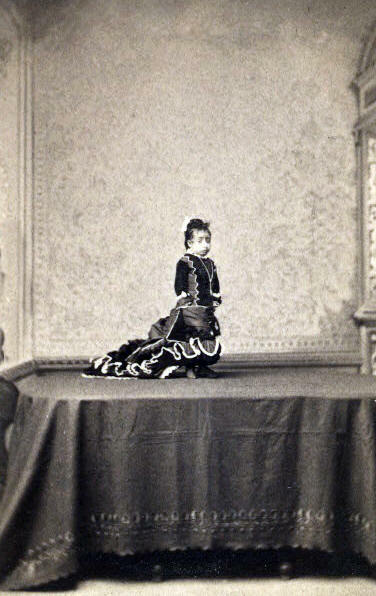 Lucia Zarate stands as the most well-known small person in the annals of littleness. 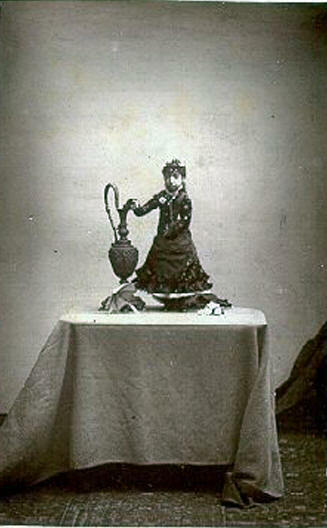 Not since the reign of the Sicilian Fairy, Caroline Crachami, in the 1820's had there been anyone exhibited so tiny and yet so well-proportioned. Lucia's early childhood is shrouded in mystery. Some say she was born in San Carlos in Northern Mexico. Others, that she hailed from Vera Cruz, which is along the Gulf of Mexico. She was first brought to the United States in 1876 and was exhibited straightaway in various venues all leading up to her big debut in Philadelphia at the Centennial Exposition, held in celebration of that Nation's first 100 years of Independence. As was the custom with showmen who exhibited midgets, she was promoted as being older than her years - in her case twelve. Hence, to this day, many biographers believe she was born in 1864. However, she was consistently said to be a year older than her exhibition companion, General Mite, who we know was born in 1872. Thus I believe she was actually born closer to 1870 making her only about 6 yrs old at the start of her brief thirteen-year career. 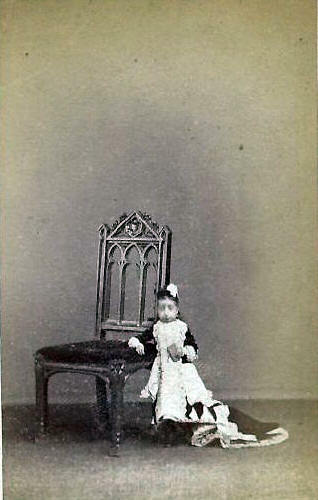 Lucia then stood about 51cm high, which would be below the knee level of an average-sized American man! It is true that over the years her stature increased but it is probably safe to say that she never exceeded 66cm. in height. Lucia arrived in Europe with her Mom Tomara and Dad Feanui and two-year-old sister Evangelina. 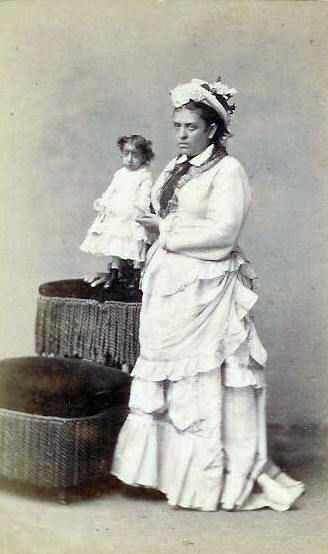 Some say that Lucia was exhibited with her sister. It is possible this is true because why else bring along a two-year old when surely there must have been other Zarate children who stayed behind in the U.S? I read somewhere that Lucia had an older brother. If that's true, then by 1880 Lucia might have had four or five siblings. Many prodigies toured Europe, all proudly proclaiming to have met all of that Continent's Kings and Queens. But as far as I know only Lucia and Francis Flynn have actually been documented by authorities at Windsor Castle as having actually met Queen Victoria. According to HRH's appointment books, this was on 26 February 1881. In America, Lucia and Francis were simply known and billed as "The Midgets" and in Europe as the "American Midgets". When Gen. Mite and Millie Edwards worked together they were known as the "Royal American Midgets"
What was it like to meet Lucia Zarate? Well, many did and have recorded their thoughts. Physically, all were taken aback by her sheer littleness. Take a look at the photo on the left. Seats of chairs are designed to be about 18" from the floor. As you can see, Lucia is not much taller than that. "Her head, about as big as a man's fist, is well shaped and covered with soft, brown hair. The only thing out of line with her size is her nose, that was evidently made for a larger girl, but it will do. She has bright, black eyes, and is intelligent, conversing with a little voice in the language of her parents", one reporter noted. Others describe her voice as "squeaking and mouse-like". Some who saw Lucia thought she "possessed a low order of intelligence" but that was only because the twelve-year old girl they thought they were looking at was actually only six. As far as her personality goes, I have read only one slightly disparaging remark: "Lucia was very exacting of attention from the crowd surrounding her, flying in a perfect rage at any apparent neglect and scolding like a little shrew." But if Lucia was of normal intelligence, I wouldn't be surprised to discover that she acted a bit spoiled or even that she was a prima do�a. It must be remembered that from her earliest memories Lucia was treated special. Always in the spotlight, with strangers fawning over her. Her health was given the utmost attention as she was of a delicate constitution. Her food was specially prepared, her clothes were hand sewn and richly embroidered and she grew fond of expensive jewelry. The travelled not only with her parents but also came to have her own maid and an interpreter. In short, Lucia was treated like a royal dignitary and, it appears, came to regard herself as such. But can you blame her! How much did Lucia earn? Reports vary and most numbers were probably greatly exaggerated but I'm confident that only Tocci, the Italian conjoined twins, commanded more per hour. Old time dime museum owner Frank Drew says "she was the most expensive exhibit I ever had" and that she got "$20 and hour for sitting on the stage." Others say she earned $500 - $700 a week. When she appeared with General Mite, together they earned $500 / wk and 10% of the profits of the manager. And still another report says that her longtime manager ripped her off, giving her way, way less than she actually earned. Lucia was said to have invested her money in Mexican real estate, owning available ranch in Chihuahua. Lucia continued to tour, mostly in the Eastern half of the United States since that was the most heavily populated part of the country and where all the major Dime Museums were. But with the completion of the trans-continental railroad in 1869 and the rapid growth of California, travelling and performing in that State was not to be overlooked. 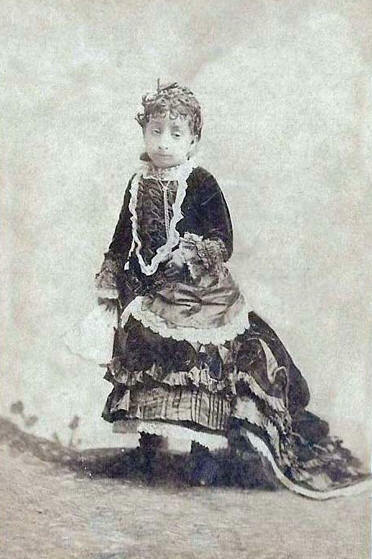 In 1889, Lucia and family contracted to perform in San Francisco. The rail line would take them through the Sierra Nevada mountains on the Central Pacific Railroad. What Lucia and family didn't know, couldn't know, was that they were heading into the worst winter storm in the history of the Central Pacific. Not just in the Sierras but the entire Pacific Northwest was affected. At one point Washington and Oregon were cut off from the rest of the world because telegraph lines were down. One report said that so much snow fell that it came within two feet of the line itself! What started the "Great Snow Blockade of 1890", as it has come to be known, was a cattle train that had jumped the tracks. One after another, train after train kept arriving in the area until 12 trains and 700 passengers became snowbound from Truckee on the California side of the mountains to Reno on the Nevada side. Lucia's train was stalled near Truckee. It was January 15th, 1890. At first nobody was overly concerned. These things happen. The railroad is prepared for such eventualities and would simply bring out the snow plows and have it cleared in no time. But the officials were not prepared for this snowstorm.. The snow fell almost continuously until 25 feet had fallen in Truckee. Day after day and night after night the RR officials were promising that the blockade would soon be lifted. But the passengers grew weary of the PR campaign the officials were waging and began demanding something be done. "Why hadn't the railroad built enough snow sheds and had enough snowplows to keep the tracks cleared?" "Why were they negligent in not properly maintaining already damaged snow sheds?" "Why can't we be taken back to Ogden and thence to California by other routes?" "Why don't they provide us hotel accommodations and adequate food?" This last complaint was of especial concern for the Zarate household. Because they had to be careful with Lucia's diet, the family had brought along food for the journey. But this was now running out as the layover became protracted. Because of the confining nature of the coaches and Pullmans, influenza began to spread among almost all the passengers. But the family managed to keep Lucia safe from the virus which to her would certainly be deadly. With the outside temperatures falling at times to 20 below zero, heating became a serious problem. The wood that was brought along was either waterlogged or buried in snow. In the meantime, hundreds of men on snowshoes were bringing food, blankets and fuel for the stoves. The Zarate family, out of food, were given some victuals, which included a can of food. Either the can wasn't lined or the food was bad but upon eating it, Lucia got sick and began to develop a fever. Since the snowplows weren't making much progress 1,800 men were recruited to do it the old-fashioned way - shoveling - but many times the snow was falling faster than they could move it. Another 3,000 men were brought in. Lucia was getting worse. Her parents were desperate to get her to a doctor but that was obviously impossible. All they could do was keep her as comfortable as possible and pray, but the little lady's condition progressively worsened. Her parents were beside themselves as they watched their tiny daughter slowing dying. On January 28th Lucia passed away. Two days later, the blockade was lifted. As the trains made their way to Sacramento and thence to San Francisco, there was rejoicing and jubilation among the 700 odd passengers. Any bad feelings they had toward the railroad executives was now forgotten. But for the Zarate family the release from their two-week confinement was bittersweet. They made their way to San Francisco and from there proceeded to El Paso via the Southern Pacific RR, with the intention of burying their daughter in the land of her birth. When the family arrived at the border, crooked and unfeeling customs agents got wind that Lucia was famous and that her family was very wealthy. The agents demanded $650 (close to $13,000 in today's money), calling it a tariff, to allow the body to cross the border. Her parents didn't have that kind of cash on them but some arrangement was made with the officials and Lucia was taken to the home of her parents in Vera Cruz, where she was finally allowed to rest.